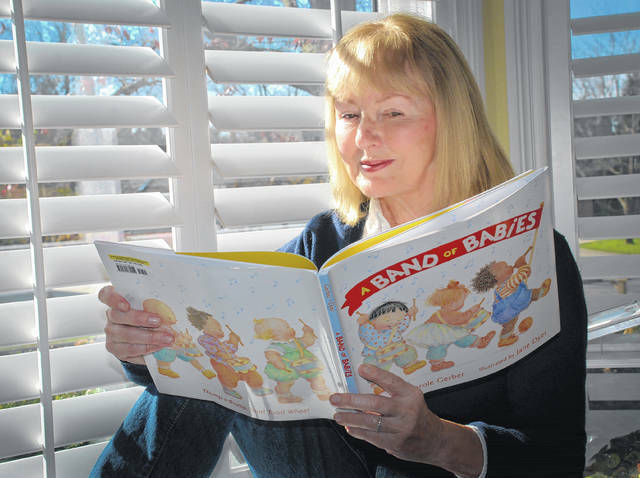 Award-winning author Carole Gerber sits in her dining room bay window leafing through the pages of her book “A Band of Babies.” The book was announced as one of Amazon’s “20 Best Children’s Books of 2017” last week. Amazon announced it’s “20 Best Children’s Books of 2017” last week. Among the titles was “A Band of Babies” by award-winning author Carole Gerber. Gerber, a resident of Delaware County, has received 14 awards for her work as a poet and children’s book author. She said she’s authored about two dozen picture books. She’s also written early readers for children, chapter books, and around 100 or so science and reading books for large publishers of children’s book. The synopsis of “A Band of Babies,” printed by “Publisher Weekly” in May 2017, reads: “Benny, a newcomer to the play-group, exudes energy as he toddles into a room filled with bored babies, whose eyes brighten with anticipation. After Benny pulls a drum from a toy box, his playmates follow suit, and Gerber’s story takes off — as do the babies … It’s an exuberant celebration of toddlers’ willful, can’t-be-stopped independence, …”. Gerber said when an adult reads a book, they’ll read it once, put it away, and not pick it back up to read it again for years. That’s not the case with children. Gerber shared a story of a woman who contacted her through the publisher of her book “Firefly Night.” The woman told Gerber her niece really loved the book, but that the family’s home burned down and they lost everything. The family tried finding a copy of the book, but couldn’t. However, she admits the majority are picture books she researches to learn what type of manuscripts publishers are buying. While reading her pile of books from the bookmobile in her younger years, Gerber said she did think of being a writer. However, she chose to teach English to middle and high school students. Gerber said she learned much while pursuing a graduate degree in journalism. “Back then I was learning from the old guys that covered the war. I would have two or three people standing around waiting for me to finish typing a story for a deadline,” she said. As a freelance writer for several years, she took assignments from publishers for science and reading books as “work for hire.” The books were written for a flat fee and many are still in circulation, she said. Gerber has worked as an adjunct professor of journalism at The Ohio State University, a marketing director, and an editor of a company magazine. She has been a member of creative teams for an advertising agency and a hospital, a contributing editor for a computer magazine, and she has written hundreds of elementary textbooks, magazine articles, speeches, annual reports, and patient education materials. Gerber said writing advertising copy for McGraw-Hill led her to write children’s books. She said she has been rejected more times than she can count. Gerber volunteers at the Stratford Ecological Center in Delaware during the spring and fall, leading groups on tours of the farm. This entry was tagged A Band of Babies, Amazon, Carole Gerber, Stratford Farms. Bookmark the permalink.